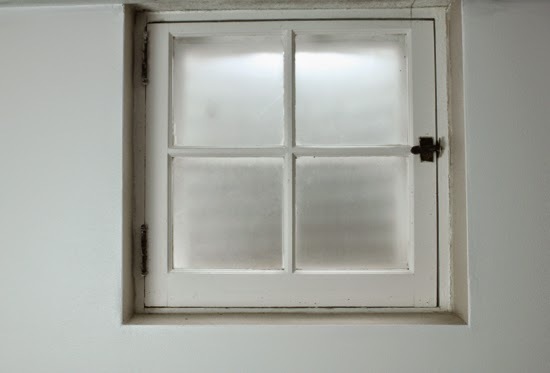 Basement windows are kind of a drag. On one hand, I'm glad there's at least some natural light coming through down there. On the other hand, the view is less than desirable. 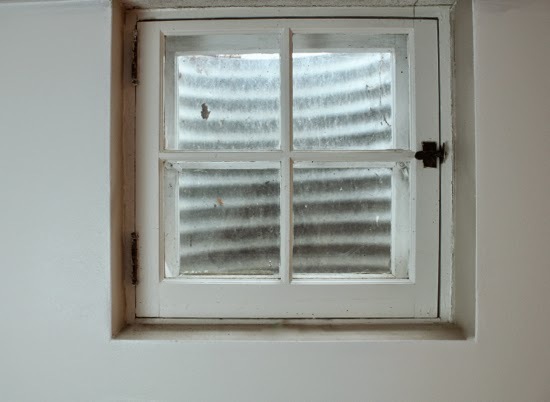 Unless you find metal window wells (and dirty glass) really pretty. I know I need to wash the outer windows, but it's winter and there's mushy snow on the ground. In order to reach the windows from the outside, I have to lay down on the ground and reach way down there. So that won't be happening for a while. But I do want to try my best to make these look decent from the inside. I've been trying to come up with all kinds of solutions for disguising the heavy metal scene. Very sheer café curtains were one option. Another idea was to wait until summer and then scrub and paint the corrugated metal, but I wasn't sure that would really help all that much. I also looked into replacing the metal wells with something else, but the other options (like faux stone) were not quite what I was looking for. And they're also very expensive. So this morning I decided to give window films a try. 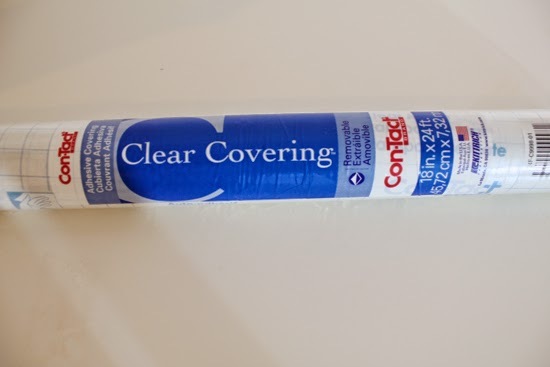 I still wasn't convinced this would do the trick, so I tried out $8 contact paper from Home Depot instead of more expensive film that's made specifically for windows. Hopefully, you can tell which is the before and which is the after picture, but just in case, the picture below is the before. 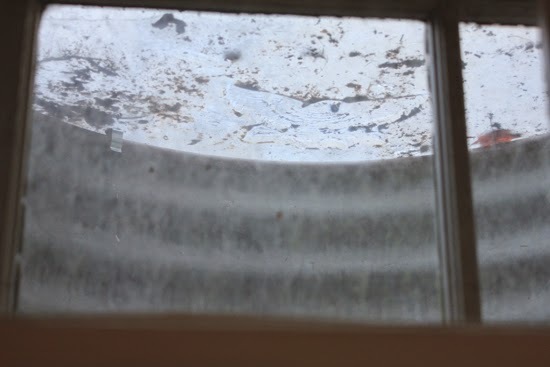 Here's another disgusting before view of the top of the window well where dirty snow is melting on the plastic covers. And here's the view with the contact paper window covering. It's definitely an improvement and there's still some natural light coming through. Below is what the contact paper looks like. 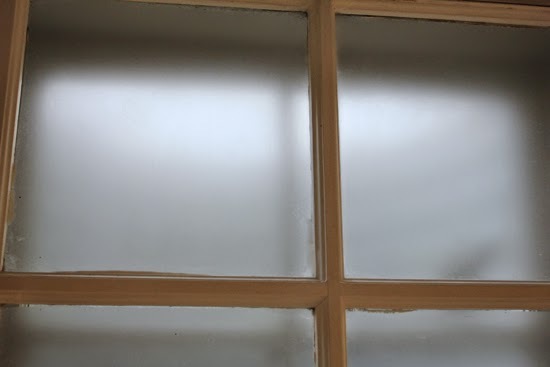 Clear contact paper gives a frosted glass effect to the window. 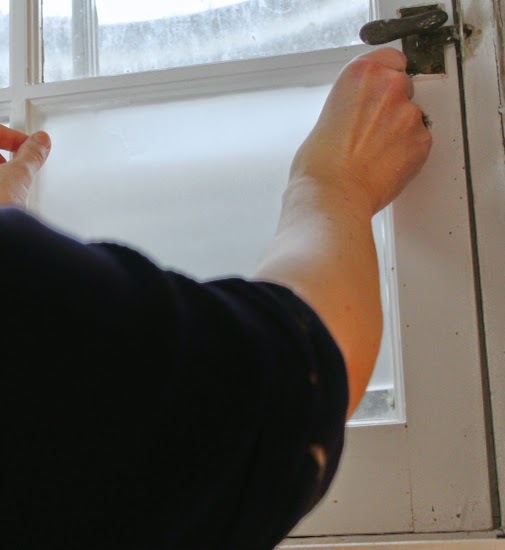 First, make sure you give the glass a good cleaning with vinegar and water or whatever you use to get your windows sparkling and let dry. 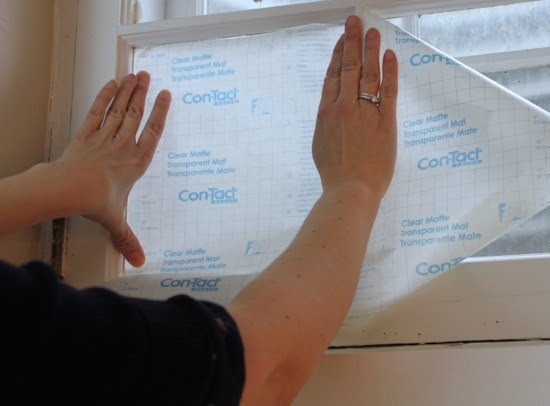 I wasn't too technical about measure the window panes. 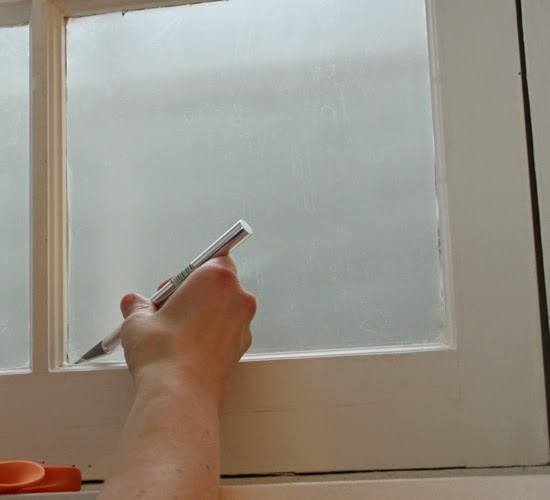 I just pressed the paper up to the window and made a crease with my finger to indicate where to cut with scissors. After that, I removed the paper backing and put the top corners in place (sticky side facing the window). I let the contact paper kind of fall into place while running my fingers down the outside edges of it. I found that the less handling of the film, the better the results. If you see bubbles, use a credit card to smooth them out towards the edges of the contact paper. You can use an X-acto knife to trim the edges. After a few practice runs, I got the hang of it and I was able to put these in place with few bubbles or creases. I'm perfectly happy with the results. The frosted glass look hides the metal window wells and makes the basement seem a little less basementy. Next step is to put up some shelving and arrange all my art and craft supplies along with some of the kids toys. I'll put up more pictures once things are looking a little more tidy.